If you thrive on interaction with others, working alone from your desk as a manuscript editor will make you restless. If you’d rather have the flu than pick up the phone and call a stranger, don’t start selling insurance. You’re going to be spending a lot of time on your business — probably more than the hours you’re giving to your current employer. Ideally, you should wake up every morning feeling energetic and passionate about the work that lies ahead of you. At the very least, your small business idea should be something that you’re interested in and that plays to your strengths. Is there demand for the product or service you want to offer? Before you quit your day job, you need to do some research to see if your idea has the potential to succeed. If you want to work independently as a financial planner, see if you can attract clients based on your existing credentials and experience. If you want to produce a better laptop bag, then you’ll want to start doing market research and product testing. You could also start by looking at areas of existing demand and thinking about what type of business you could start that would fall into one of those industries. 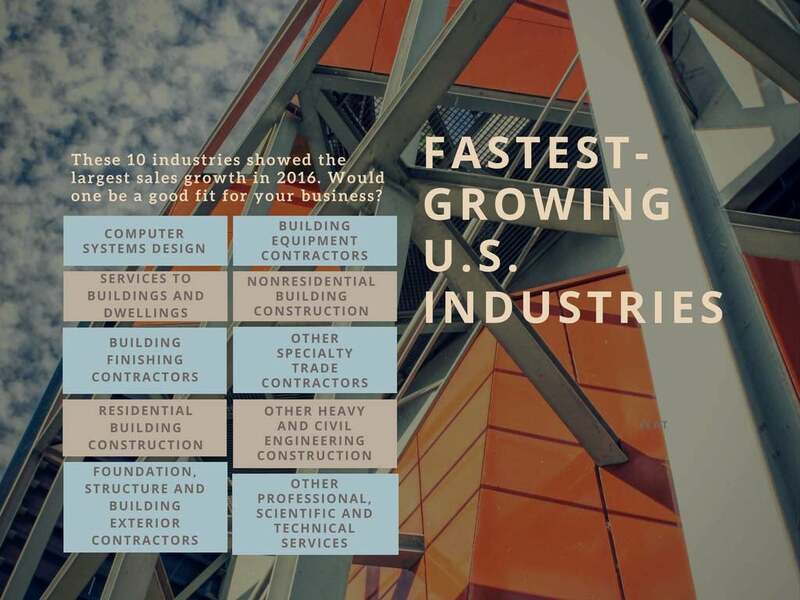 The graphic below shows the fastest-growing U.S. industries in 2016. It can be hard to find the time to pursue your own business while you’re still working for someone else, but it’s the most secure way to test your idea without taking a big financial risk. And if you’re not motivated enough to find the time for it, maybe you’re not really that interested in becoming a small business owner and applying for a different job would make more sense. How much do you need to earn? We’ll talk more about developing a business budget in a later section, but for now it’s enough to say that you need to weigh the earning potential of any business you want to start against your monthly expenses. How much will it cost to operate the business, and how hard will it be to generate a profit with those kind of costs? What about personal expenses? If you have to make a $2,500 mortgage payment every month, sign private school tuition checks and pay off your Lexus, it might be a bad idea to open a brick-and-mortar bookstore unless someone else in your household can comfortably cover all of your personal expenses and everyone else’s with their paycheck. How much do you want to earn? Some of us want to be rich and are willing to take big risks on new ideas in pursuit of that goal. Most people just hope to live comfortably with a good work-life balance and can’t afford big risks. When choosing your line of business, consider what kind of earning potential it offers not just in the first couple of years, but down the road. Do you like to interact with others? Some small business occupations lend themselves to solitude, like accounting or writing, while others require you to be out in the world, constantly schmoozing and selling yourself to people, like any startup that requires you to raise money from investors. If you just want to be left alone, don’t open up shop as a publicist. If you feel compelled to call your mom for a chat anytime you’re alone for more than 15 minutes, don’t start a web design business. What hours and days do you want to work? If you don’t like working from nine to five, you don’t have to when you’re self-employed. You can choose a line of work that suits whatever hours you prefer. That said, many businesses require that you work according to your clients’ schedules. This means arranging your life to fit your customers’ needs. If your customers are on the opposite coast or in a different country, that can mean a serious shift in hours the cuts into time with family and friends who work typical hours. How many hours a week do you want to work? Some small businesses lend themselves to longer hours than others. If you decide to open a restaurant, you might as well make space for a cot in your office. A sales-based business that involves large commissions, on the other hand, could leave you with more free time if you’re skilled enough. How much time are you willing to spend away from home? For some people, the ability to stay home all day is a major draw of becoming a small business owner, but not all small businesses are home businesses. Becoming a consultant might require you to attend lots of meetings and travel frequently. Open a boutique and you’ll spend most of your waking hours at your store, at least initially. Once you figure out want you want to do for a business, it’s time to figure out how you will afford it. Do you have an idea for a business, but are struggling to find the time to launch it? Here's how you can start a business when working a full-time job. Going into business for yourself can be a fantastic, liberating experience. But beware of the hidden pitfalls. Retirement consists of four stages, each with different expenses and different budgeting needs. Here's how to manage your money through them all. These four strategies can help reduce financial stress. The first three years of owning a small business are the toughest. Use these tips to push through and position your company for success.